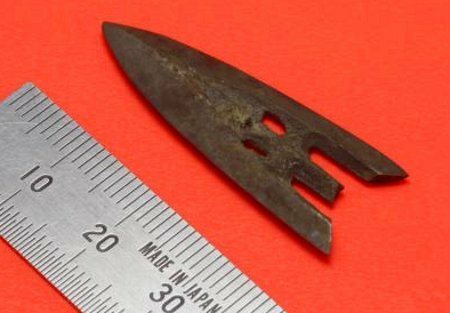 It was announced on January 23 that a bronze arrowhead dating back to the Warring States period of China (BC 5~3 century) had been uncovered at Minamigata Iseki (南方遺跡), Okayama city, Okayama prefecture. The bronze arrowhead measures 3.7 cm long, 1.4 cm wide, and approximately 2 mm thick, and weighs a light 3.7 grams. The edges of the arrowhead extend far down along both sides, giving this style its namesake: double-winged bronze arrowhead (双翼式銅鏃). Excluding the broken tang, the piece is intact. While extremely sharp, its size, weight, and rarity suggest it was not for actual battle, but rather a prized object or burial good. The Minamigata site was a major village in the Kibi (吉備) region during the Yayoi period. A hub for the movement of goods and people, it has revealed many intriguing finds, but this is the first time a bronze arrowhead of this type has been found in Japan. The arrowhead was found in an artificial channel (8 meters wide and 1 meter deep) dating to the Middle Yayoi period. The article below assigns the Middle Yayoi period to the 2nd century BC. Assuming this is an acceptable date, there would have been a considerable amount of time between its manufacture and the time of its disposal. Advances in AMS dating, however, have prompted sweeping revisions of Yayoi-period dates. A temporal assessment of this find will inform our interpretation of how long it took to get where it did or how many generations it was passed down as a prized possession within Japan. Nevertheless, it is an extremely rare find that speaks to the vibrant, international nature of Yayoi society.